UPDATED COMPARISON FOR 2018, INCLUDING SHOPIFY PLUS, BIGCOMMERCE ENTERPRISE, AND MAGENTO 2. As the world becomes increasingly more digital, the eCommerce market has responded by exploding across thousands of categories. And as eCommerce shopping has become the norm for consumers around the globe, an increasing number of different eCommerce shopping cart software has launched (also called eCommerce platforms or eCommerce software). The more brands of shopping cart software that become available, the harder it is for businesses to choose the best eCommerce platform for their particular business needs. Currently, at least 12 shopping cart software companies deserve to be considered major eCommerce platforms. That list of eCommerce solutions includes Shopify, Magento, Magento Enterprise, WooCommerce, BigCommerce, Volusion, Hybris, Demandware, Prestashop, Zencart, 3dcart, and Squarespace. However, three of them are frequently regarded as being better than the rest for their ability to meet the diverse needs of a broad range of small, mid-size, and large businesses: Shopify, BigCommerce, and Magento. Each of these also now has a plan or product that specifically caters to larger eCommerce businesses in the enterprise category. Shopify offers Shopify Plus, BigCommerce has BigCommerce Enterprise, and Magento has Magento Enterprise. If your business is debating about which of these platforms to use, Coalition Technologies can help. As a Shopify Expert, Magento partner, and BigCommerce Elite partner, we have a unique insight into how these platforms work. We’ve been working with these platforms for nearly a decade and have a massive portfolio of successful storefronts using each. To start thinking about which one would be the best fit your business, let’s do a Shopify vs. BigCommerce vs. Magento review using five eCommerce platform criteria that impact every business: platform features, the total cost of ownership, ease of use, marketability, and business viability. Before we dive into the longer review, our current rankings have BigCommerce on top for merchants selling between $1M and $5M online each year, with Shopify leading in the under-$1M category. BigCommerce Enterprise and Shopify Plus compete about equally between $5M and $10M annually with unique business-type challenges for each. Magento Community makes its entrance around $5M+ in annual revenue since it’s more flexible and scalable than the SaaS contenders, but it also has drawbacks. Past $10M and we start to see the playing field become cloudier based on particular business types. Magento Enterprise moves to the top for merchants selling over $15M, although features are in beta for Shopify Plus and BigCommerce may help close that gap. If you’d like to skip ahead, you can click on the links below to find our recommendations based on eCommerce business size, or based on the platform. Small Business eCommerce Sites (less than $1M in online sales) Should Use This eCommerce Platform. The smaller the business, the more likely it is to find that Shopify is the best eCommerce platform for its needs. Magento Community and Enterprise are not considered because their total cost of ownership (TCO) is so high that they tend to be out of reach for most small businesses. Shopify’s selection as the best option for smaller companies is especially warranted for what Coalition calls micro-merchants—individuals who use a primary source of income to fund eCommerce dreams as a side gig, but who have little-to-no specific eCommerce or business management experience. Usually, micro-merchants will sell less than $50,000 in revenue through their online store. Micro-merchants tend to be one of the largest segments of the eCommerce store market, although they also tend to be the shortest lived (meaning their stores are often quickly cancelled). While both BigCommerce and Shopify were evenly footed in the micro-merchants category several years ago, we’ve seen some divergence develop between the two platforms. This is because of different ideals for their core software consumer. BigCommerce pivoted to focus on the small business to the mid-market category, and lately the small enterprise category, while Shopify has spent the last several years aggressively marketing to micro-merchants, small eCommerce businesses, and only recently has made a move to target more substantial eCommerce ventures. BigCommerce wins this category with better built-in marketing tools, improved discounting and sales features, and better out-of-the-box (OOTB) integrations with other sales channels and marketplaces. Within the first few plan levels, BigCommerce’s small business merchants have access to great built-in shopping feeds for Amazon, eBay, Facebook stores, Google Shopping, and more. They also have a more robust range of discount options that can be created using coupon codes, various catalog conditions (i.e., sale in this category for this period), or shopping cart conditions (buy x product get a discount on y item). Shopify is competitive for most micro-merchants in each of these areas (since micro-merchants tend to have lower demands and lower expectations for their platform). However, more established small eCommerce businesses may find themselves frustrated by the constant referral to the app store for additional capabilities in content marketing, SEM, SEO, discounting, and product merchandising. The total cost of ownership is the tiebreaker when comparing Shopify and BigCommerce for the under $1M category. 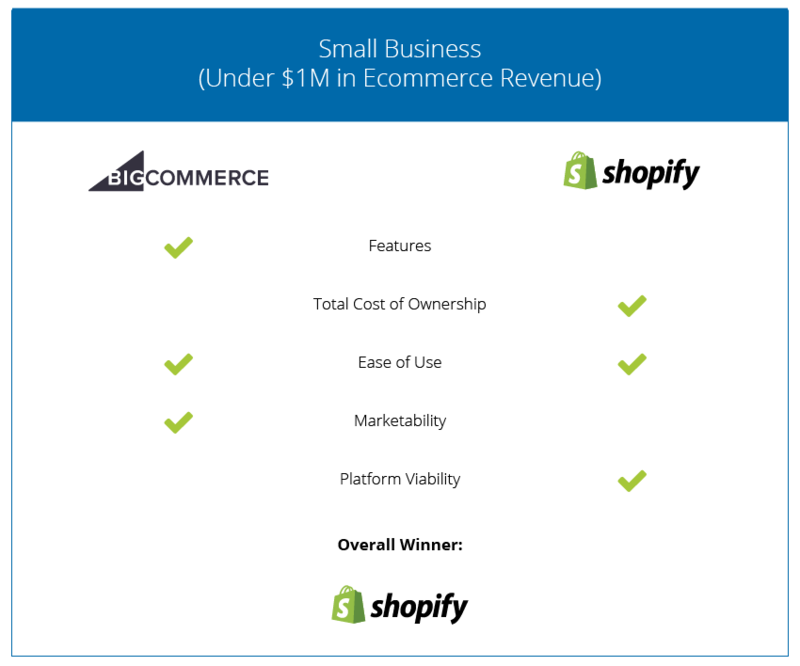 Ultimately, due to the reasons listed below, Shopify clearly wins the TCO category for some of the smallest businesses (less than $100,000 in online revenue) and still holds a competitive edge against BigCommerce until (about) the $500,000 mark. First, Shopify’s theme store is a lot more mature than BigCommerce’s. That maturity shows in the range of designs, and the number of viable offerings designed to support businesses in categories from consumer electronics to fashion to home goods. While BigCommerce has made big strides in this area, the themes tend to be pretty ‘one-size-fits-all,’ sharing many visual properties with one another. This notion is mainly tied to the use of a single, apparently less creative, agency for the majority of the BigCommerce premium themes. By comparison, Shopify has more agencies and partners engaged in design and development of great looking, modern themes. The second reason Shopify pulls ahead is because of its easier-to-make customizations for novice users or developers new to the platform. Shopify has also been using Liquid, its open source template language, for a long time, and it is quite easy to adjust too. BigCommerce, however, is a bit more of a struggle, especially when working on its latest template framework, Stencil. Shopify has also done a lot to make it easier to make theme-related edits as a novice user without needing to engage in the code itself. For micro-merchants and our small businesses who cannot afford to pick-up expensive designer or developer costs, Shopify offers the better value. It’s important to note that Shopify starts to lose these advantages as businesses scale and the need for custom-theming or development increases. Shopify also tends to require more paid apps at almost every business tier than BigCommerce, and that can mean the total cost of ownership across longer-lived stores dramatically increases. Outside of the coding languages, managing a BigCommerce and Shopify store is about as easy as it gets. We used to tell merchants considering their first eCommerce store that Shopify or BigCommerce were a step more complicated than running a Gmail account. And not much has changed since those days. Almost everyone can manage a Gmail account, so for smaller businesses with less complicated business requirements, BigCommerce and Shopify are both super easy to learn and use. Backend, administrative functionality is clearly labeled, supported by excellent documentation, tool-tips, and tutorial content. Most functionality is accessible through several different navigation pathways that are intuitive and logically created. Ease-of-use is one of the interesting areas where the eCommerce world has responded the most to small businesses. We’re seeing increasing numbers of enterprise-grade software moving towards improving their ease-of-use, based on the approach first offered by the likes of Shopify and Bigcommerce. Many think Marketability is similar to the Features category (listed above), because many eCommerce platforms’ features are designed to improve a store’s marketability. And, our analysis of the different software options in this category closely follows our comparisons for Features, but given Coalition’s reputation as a thought leader in eCommerce marketing, we still wanted to highlight some of the subtleties that could make a big difference. As noted earlier, BigCommerce has some specific advantages for marketing that Shopify can’t quite equal. Without the need to go to 3rd party apps, BigCommerce (with its lowest-level plans), allows merchants to quickly and reliably post products to a variety of major shopping marketplaces, or to a variety of advertising channels via feeds. BigCommerce also consistently outperforms Shopify in organic search engine optimization capabilities with more eCommerce sites ranking successfully in Google and other search engines, agnostic of prior business success offline, or other online marketing channels. Features like auto-generated HTML sitemaps, easily-managed robots.txt files, faster load times and more, help win the battle here. One important evaluation-factor of eCommerce platforms we don’t often see addressed is the viability of the platform. Given we’re breaking-out platform recommendations based on business size, we’ll discuss platform viability as it pertains to the store’s size. Shopify is the winner here, again. There are a few reasons for this, but the primary one is its much larger customer base in the micro and small business categories. There are tens of thousands of more merchants on the Shopify platform in this group than in all of BigCommerce. While Shopify would love to present itself as an enterprise-ready platform (mainly for share-pricing reasons), it also realizes that it needs a steady stream of new small business sign-ups to keep floating its price where it’s at. That’s led to a lot of aggressive marketing efforts on Shopify’s part to try and keep the general buzz going in this small business category. Given its publicly traded status, numerous possible income channels (via store plans, retail, Payments, Shipping, Kit and others), Shopify has better business viability. The chances are that its business direction, focus, and the opportunity to compete for hundreds of thousands of merchants will not change soon. Mid-market eCommerce Merchants ($1M to $15M) Should Use This eCommerce Platform. As we go up-market in eCommerce merchant size, it’s important to remember that reviews like this remain valuable as a general guideline, but lose some value for specific case scenarios. That’s why professional agencies like ours, that excel in identifying the right eCommerce platform, are a necessity for the eCommerce market. As the eCommerce platform market has stabilized around a few key players, we’ve seen agencies switch banners and choose platforms for no qualitative reason on behalf of their clients. Instead, their loyalty and recommendations are being driven solely by lead introductions and highly lucrative affiliate deals from their platform of choice. As one of the country’s top SEO agencies, we at Coalition have been able to sustain and grow our business through strong marketing practices. Search us in any major metro area in the US and chances are we’re ranking in the top 3 spots, despite having a single primary office location in Los Angeles. While we do receive affiliate marketing dollars from select platforms, we do not depend on that affiliate relationship for significant portions of our revenue stream, and we do not depend on any single eCommerce platform for leads, unlike most agencies. Because of that, we provide more qualitative and prescriptive recommendations for our clients. If you’ve been frustrated by the heavy-handed sales pitches that other partners have given you, please contact us. Now back to the business at hand! What eCommerce platform is the best for most mid-market eCommerce merchants? Our typical pecking order in this category is BigCommerce, Shopify, Magento Community, then Magento Enterprise. BigCommerce usually wins, handily, from the $1M to $5M category. From $5M to $10M, Shopify Plus is a strong contender with BigCommerce Enterprise, although Magento Community and Magento Enterprise have valuable use cases too. Let’s dive into our five evaluation criteria and see the reasoning behind our ranking. When you’re a mid-market merchant you’re often making your eCommerce platform selection first based on what you do today and, second, what you want to be able to do tomorrow. 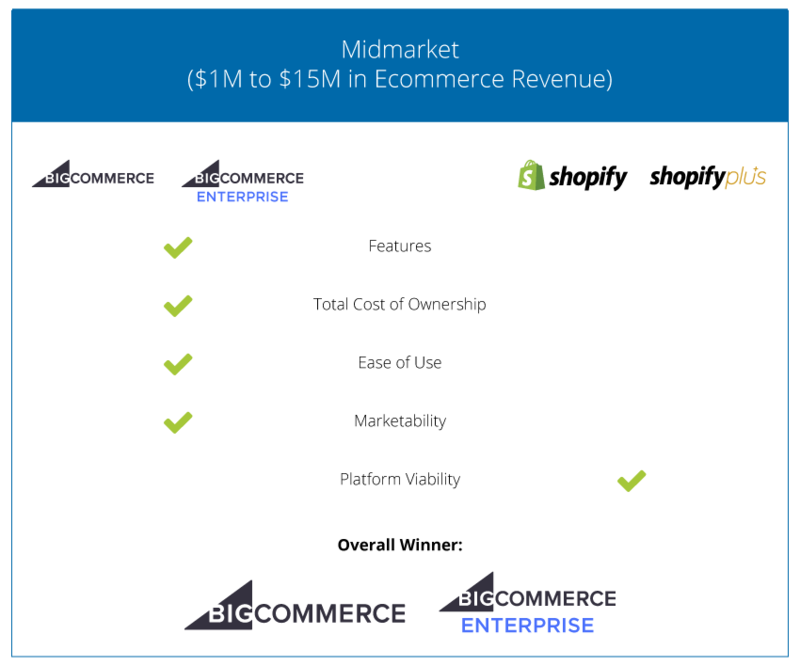 For most of our mid-market eCommerce merchants, especially until around the $5M to $7M mark in annual revenue, BigCommerce is the handy winner. As we’ve noted in the small business segment, BigCommerce’s OOTB features for all plan levels (including its introductory Enterprise plan) are a lot more robust for customers than the comparable options from Shopify. It also has been more eCommerce-focused on its feature development than Shopify, and that holds a lot of promise to mid-market merchants looking to future-proof their business with the next eCommerce site they launch. While Magento’s feature offerings are competitive here, they are not necessarily a more robust OOTB offering than those of BigCommerce and usually will require several extensions to close the gap with our pick in this group. As a result, Magento won’t score as highly. What are some of those key feature advantages for BigCommerce over Shopify and Magento? For this merchant class, BigCommerce boasts the ability to handle more SKUs per product (600 SKUs per product with up to 250 options, versus the Shopify cap of 100 SKUs per product and three options per item), which is a significant advantage. This sort of flexibility is especially necessary for businesses that offer customizable products or have products that are marketed through more diverse channels. Magento can match BigCommerce in the product customization arena, although the platform’s ability to quickly deliver more complex products on the front-end, doesn’t quite keep up without further development customization. Magento uses a system of Attributes and Attribute Sets to allow store admins to easily add numerous, custom informational fields, options, or configurations of products. For a long time, this was one of the critical reasons that Magento Community was a platform of choice for merchants at this level. The BigCommerce integrated options for discounting extend well beyond the limitations of coupon codes, which is one of the major pains our leads cite when abandoning Shopify. Some Shopify merchants express frustration that features seem to roll out either aimed at the small business category (more DIY type features) or at the enterprise category (plus the customers who usually pay $2k + per month). Customer-group segmentation, customer-group based content (including product catalog restrictions), and customer-group based promotions are another area that Shopify can’t match BigCommerce or Magento at most plan levels. Shopify Plus starts to address some use cases through its Wholesale feature set, but it’s a bit more narrowly defined in intent, than the comparable BigCommerce plan. Customer-groups can be used to market to higher value customers, segment catalogs for consumers as opposed to retailers, and can be used to create promotions for specific affiliate or partner relationship. While Magento offers a customer-group feature that is competitive with BigCommerce, it can also ‘go beyond’ through the use of its multi-site, multi-store capabilities which allow for nearly endless segmentation of a business’ audience. BigCommerce continues to hold its advantage in feeds to major marketplaces and advertising platforms whereas reliable feeds for Shopify and Magento often depend on customizations or use of paid 3rd party applications. The last major area where we see Shopify and Magento fall short of BigCommerce in the mid-market segment is in its built-in reporting and analytics capabilities. This is mainly because the more robust offerings are limited to the Plus plans, which come with a much higher price tag than the Advanced plans. Magento Community is often used as a legacy solution for merchants in this category but most merchants have started to move on, as increasing concerns about speed, server uptime, and security have made Community’s owned or hosted approach seem dated. In past years, we might have considered these more a function of the total cost of ownership in eCommerce; most merchants now regard them as a platform feature. Magento Enterprise, like Magento Community, can compete with BigCommerce in the feature category, but it too falls victim to the issues with the hosted approach noted before. While Magento now offers a cloud solution, its pricing is well out-of-reach for most merchants in this category, so we don’t even consider it a viable contender for this market segment. Shopify Plus starts to climb into contention at the top-end of this audience segment, as does Magento Enterprise, namely because its fees become more approachable for merchants handling over $5M a year. While Shopify Plus continues to lack overall features when evaluated side-by-side with BigCommerce Enterprise and Magento Enterprise, the product team at Shopify has closed some of the more severe gaps. New scripting and API functionality has allowed Shopify to compete with discounting and promotional offers in a way that Shopify hasn’t before. Shopify Wholesale helps close up a particular eCommerce gap for B2B merchants that Magento and BigCommerce have leveraged over the years. Here again, our pecking order is BigCommerce Enterprise, Shopify Plus, Magento Community, and Magento Enterprise. The big factors in TCO for a mid-market merchant are the costs to maintain the hosting speed, uptime, and security, which BigCommerce Enterprise and Shopify Plus effectively resolve as part of their billings. Magento Community and Magento Enterprise depend on 3rd party hosting and service providers to keep up to date here, and that can mean additional maintenance costs run into the tens of thousands of dollars annually, without addressing hosting speed and uptime. BigCommerce Enterprise plans tend to start around $1,500 a month, although promotions and offers for annual contracts can lessen that cost. Shopify Plus usually kicks off around $2,000 a month, but with some of the little ‘gotchas’ for transaction fees, many of our Shopify Plus merchants end up starting closer to $2,500 a month. Like BigCommerce, Shopify is quick to discount if merchants are willing to sign up for long-term contracts (and sometimes just because they have an earnings report coming up). Magento Community and Magento Enterprise hosting will usually start in the mid-$300 to $500 a month range and will increase as server demands go up. It’s worth noting that many ‘Magento Enterprise hosting’ partners will offer higher performance hosting as a starting point because it’s for Enterprise customers. For the lower half of this audience-segment, that hosting can be oversized and on-demand or cloud services could be better choices to avoid unnecessary costs. We usually see starting quotes for small Magento Enterprise customers’ hosting at about $1,000 a month. Where both Magento Community and Enterprise really lose their grip on the total cost of ownership is in the security and maintenance side of things, as support for a customized Magento storefront can be a bear, with annual costs easily running north of $15,000 without talking about new features or enhancements. Shopify Plus loses the edge to BigCommerce in TCO because of its higher upfront cost, which is exaggerated for Shopify merchants because of the huge leap from the Advanced Plan to Shopify Plus in pricing (which is mitigated a bit by lower transaction fees). Shopify Plus also is more dependent on custom scripting and development to get the full value out of the solution, and some Shopify Plus merchants may find they still pay a lot to third-party apps for functionality that’s available to BigCommerce Enterprise customers as part of their plan’s price. Since we already covered BigCommerce and Shopify in the lower tier, we’ll spend most of our time with Magento Community and Magento Enterprise, once we get passed the actual rankings. For ease of use in this eCommerce market segment, BigCommerce narrowly edges Shopify for the prize. While we do appreciate that Shopify continues to make theme editing and certain actions (like launching promotions) easier than BigCommerce, the dependency on custom scripts and 3rd party apps for many merchants in this category starts to create breakdowns in ease-of-use. The less regulated and cohesive a store’s ecosystem is, the more likely it is to present problems as merchants introduce new staffing or attempt to pull off more complex, coordinated marketing campaigns. Magento Community and Magento Enterprise had a big upgrade in ease-of-use when they moved to v2, adopting much of the look and feel that BigCommerce and Shopify merchants were used to from years prior. However, two things continue to contribute to their shortcomings. First, the overall language of the platform remains a bit clunky and speaks to Magento’s earlier era as a developer-first platform. Many merchants won’t inherently know what an attribute or attribute set is. They may not quickly grasp what a static block is. Some will struggle to describe the difference between Magento’s two major discounting segments. (HINT: One is about what a customer has in their cart, and the other is about predefined sales and promotions throughout a store). Secondly, like Shopify and Shopify Plus, the dependency on customization and apps tends to muddy up the UX, and it becomes harder to maintain training and institutional knowledge for more complex eCommerce businesses. While some of that customization and app integration may allow you to ‘do more’ with the platform, you pay the price elsewhere. Things get more interesting in the marketability of eCommerce platforms at this scale of business. Why? For one, businesses tend to be marketing to more diverse customer groups when in the ‘million-dollars-plus’ eCommerce category. This is because eCommerce platforms are expected to do more across major marketing channels and are also expected to allow for more nuanced marketing offers within certain marketing channels (major or minor). Major marketing channels include SEO (organic search ranking), SEM (paid search advertising), PPC (paid advertising through other networks than search), social media marketing (excluding paid social), email marketing, affiliate marketing, and PR. For the sake of simplicity, retargeting and remarketing are lumped together with paid advertising formats, and things like ‘influencer marketing’ tend to be put in the affiliate or PR category. We exclude non-digital formats like television, radio, and others since they still play an ambiguous role for most eCommerce businesses. Out of the box, BigCommerce Enterprise tends to be our preferred platform for SEO. With built-in XML and HTML sitemaps, alt image tagging, the ability to provide proper headings and document structure, integrated Schema, a great blogging tool, quick loading pages, and greater speed optimization using Akamai’s best-in-class services, it has a pretty cut and dry advantage. Magento Community and Enterprise can pretty readily compete in most of these areas, although slower load times on average and the cost of speed optimization are deterrents to their scores. Shopify Plus does well in the speed category (Shopify’s theming language, as previously covered, is quite fast) but comes up short in most other areas. However, Shopify Plus’ SEO shortcomings don’t quite reach the level of being serious, ‘look-at-another-option,’ drawbacks. So, Shopify Plus stores that are well optimized, have great keyword strategies, rich content and are strong in other areas of SEO (link building namely) will rank right alongside BigCommerce merchants. When reviewing many top ranking sites across some of our key categories, you’ll see an outsized number of Magento Community stores, although the number has been dwindling in the past few years. That doesn’t prove Magento Community is a ‘better’ SEO platform than others, it just was the more popular platform of choice for many eCommerce merchants that have also invested heavily in SEO. On the SEM front, BigCommerce Enterprise once again takes the cake for this merchant class. Its OOTB feed capabilities are more stable and easier to implement and maintain than those that come with Shopify Plus or the different Magento options. Additionally, its tagging tool and capabilities tend to allow for the incorporation of more complex data layer requirements than those afforded in the Shopify cart and checkout experiences which means you can do more with some of your SEM advertising efforts and their automation. Shopify wins for us in the social media marketing category because of one important feature. Outside of that, social media marketing is a bit of a toss-up for us, honestly. All three offer little in the way of native social media marketing support (non-paid advertising), and most businesses will elect to use a paid social media marketing SaaS to handle their content publication and distribution efforts. Shopify’s one big advantage is how robust and easy they’ve made it to implement buyable content, anywhere. Unlike the other platforms, which tend focus on eCommerce within the confines of the eCommerce store, Shopify’s allowed for a more decentralized purchasing experience, which is valuable in social media. On the PPC front, all of the platforms in discussion today support the major, non-search, paid advertising opportunities. Magento Community and Magento Enterprise, due to the nature of their builds, are more extensible to support PPC advertising efforts that focus on specific industry verticals or niches. When properly implemented, Magento store owners can also see greater opportunity in integrating their store data to paid advertising channels and vice versa. By allowing for more two-way communication between advertising platform and eCommerce platform, data can be more actionable and as noted previously, more automated. With more and more machine learning and AI tools entering this space, that advantage could prove significant in years to come. Magento Community and Magento Enterprise tend to lead the pack in email marketing options because their integrations with enterprise email marketing solutions like Bronto and Klaviyo are more mature than those offered by BigCommerce and Shopify. As with the PPC and SEM categories, the closed nature of the BigCommerce and Shopify cart and checkout experiences usually means less flexibility in capturing and retaining customer data for use in audience segmentation or remarketing elsewhere. Magento Community and Enterprise also take the cake in the affiliate marketing category because they support a deeper level of integration for affiliate marketing platforms or homegrown affiliate marketing networks that are more common in this business tier. Because Shopify and BigCommerce tend to hold affiliate marketers at arm’s reach (integration typically occurs through the use of JS tagging and post-transaction API integrations), it becomes more difficult to see what’s driving a business’ affiliate outcomes. PR efforts tend to occur outside of the platform mostly, and since all of these eCommerce platforms tend to be more restrictive on their OOTB support for a unique content experience, no single one stands out more than another. Worth noting – the BigCommerce and Shopify hosting can both handle massive spikes in traffic that accompany successful PR campaigns. We’ve had clients on the Ellen Show, Today, GMA, and in the NYT experience massive, sustained traffic to their sites at various plan levels without a meaningful impact on site performance. A properly configured Magento environment could do the same, but the merchant may absorb a lot more costs. This is probably the most competitive portion of the eCommerce market today. While there is plenty of advertising material targeting enterprise merchants large than this group, the top end of the eCommerce space is pretty firmly invested in homegrown solutions that are so deeply tied into other business operations they’d be hard to extricate. Shopify and Shopify Plus. 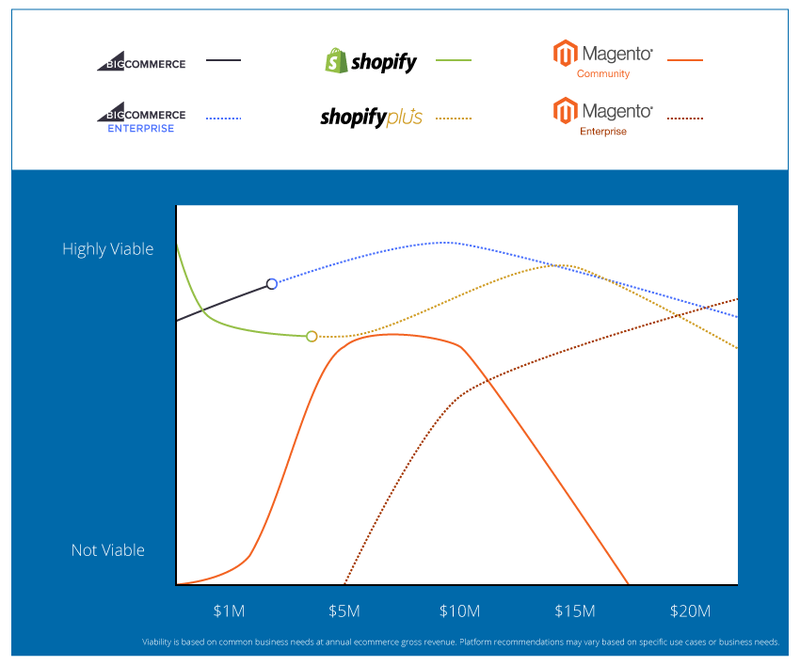 As noted earlier, Shopify is a publicly traded company that brings in revenue from a broader range of categories than either BigCommerce or the Magento platforms. That creates a certain level of stability that can be promising at a surface level but concerning at a deeper level. Businesses are beholden to where their money comes from, and since Shopify draws its monetization from its payment services, it may not be as motivated to invest in eCommerce capabilities. However, it does have enormous success in the eCommerce space and likely has a better market position than either BigCommerce or Magento due to its affiliate marketing efforts and marketing budget. Magento Community and Enterprise. Magento has struggled in the viability category for us over the last several years. It has changed ownership several times in recent history, and with each changeover, it seems to try and redefine itself and what portion of the market it wants to be in. It has tried-and-true small business products with Magento Go, but also has greater monetization of the mid-market category (with some packaged offerings for Magento Community), and now seems to want to move back upmarket with Magento Enterprise and Magento Enterprise Cloud. Shopify and BigCommerce both have taken advantage of the uncertainty around the business and moved into a larger merchant category than they may have dared if Magento hadn’t struggled. Of the three, it is the one we have the greatest concerns about for long-term business viability. BigCommerce is the smallest of the three entities but is likely well-positioned for the immediate and long-term future. It is well-funded, with partners that have significant digital experience and interests, and has managed to carve out a foothold in the mid-market and small-enterprise space that others struggle with. Its merchant count is also nothing to sniff at and, with faster growth in the higher volume eCommerce merchant category, we’d expect that pace to increase. It also has been rumored to be considering an IPO which could infuse a lot of cash and awareness about the product in the next few years. If we had to stack rank them, we’d go with Shopify and Shopify Plus, BigCommerce and then the Magento offerings. Phew! On to our last merchant category. It’ll be shorter since much of what we’ve said already still applies. We’ll highlight a few final differentiations before we move onto the standalone platform overviews. Full disclosure here – because we primarily work with eCommerce platforms (and not ERPs, other enterprise software solutions, or custom eCommerce platforms) we don’t deal with this category of eCommerce site as much. Frankly, most of our eCommerce platforms don’t really engage in this space as frequently either. That doesn’t mean that Shopify Plus, BigCommerce Enterprise, and Magento Community may not make rare appearances north of this $15M threshold – they do, and with more than a handful of stores each. It’s just to say that this is not their core focus, and they all have a long way to go before it is. So what types of businesses might be doing $15M plus on our selections? Usually, they’re direct-to-consumer businesses that have substantial retail distribution or presence and have significant brand awareness that drives revenue to their eCommerce store. This means the eCommerce store is secondary to their other sales channels, and the demands on its performance have traditionally been lower than its other sales channels. It also means that executive teams were more ambivalent about the eCommerce site and its competitiveness. Of course, that is changing rapidly, and one of the biggest greenfield opportunities for eCommerce platforms is their ability to successfully transfer retail store success to online store success for merchants at this level. We also note as part of our ‘typical small enterprise customer’ profile that they are usually offering a direct-to-consumer product (but, not necessarily selling directly to the consumer). Why? Direct-to-consumer products usually have simpler eCommerce requirements to merchandise, sell, and fulfill them. These aren’t hard and fast rules, and we’ve worked on many projects that break all of these assumptions (and then grind them underfoot), but given the diversity in this category, it can be harder to typify. So who are our picks in this space? First up is Magento Enterprise. Shopify Plus follows, and then BigCommerce Enterprise. Magento Community is a non-starter in this merchant tier. Let’s dive into our five categories to understand why. As the name would imply, Magento Enterprise is focused on this market in a more meaningful fashion than other eCommerce platforms. It also has more history here, having been marketing to and used in support of this segment for nearly a decade. Given that it offers both an on-premise, hosted solution and a cloud offering, it can be deployed in a variety of methods that would appeal to IT teams and CTOs with various requirements driving their eCommerce projects. It is also extremely feature-rich, can be easily extended, and customized. The fact that it allows for a lot more customizations than our SaaS platforms (Shopify Plus and BigCommerce Enterprise) is also especially important from an integrations standpoint. While more CTOs and IT teams are acclimating to the limits of SaaS, many are still resistant to the idea that one of their primary software vendors might tell them ‘no.’ That resistance to ‘no’ can be reinforced by the expense of other operations-software and business systems. Many ERPs tend to be more static and harder to replace or integrate with than a SaaS eCommerce platform and so they need more flexibility for new additions to the ecosystem. Magento Enterprise provides the most opportunity there. We’ve already covered some of the specific features that drive these platforms in the mid-market section, but I’ll highlight a couple of things that help determine our ranking behind Magento Enterprise. Magento Community nearly gets the ax right out of the gate due to concerns over its security and PCI compliance. While similar to Magento Enterprise in their offerings, fears over self-maintenance and a lack of true support will eliminate it from consideration pretty quickly. A rapidly growing portion of the eCommerce market that is especially appealing to enterprise-class marketing and IT teams is called headless eCommerce. In the headless eCommerce model, the buying and purchasing capabilities of an eCommerce platform can be remotely accessed from a front-end using a custom or different front-end CMS than that of the eCommerce store. Headless developments can allow for a more dynamic user experience, richer content presentations, and are easier to integrate into well-developed, mature web development teams at enterprise organizations (for instance, an enterprise may be accustomed to using a particular development stack and may have substantial web and mobile properties developed that eCommerce is an ‘add-on’ to). Shopify Plus also has some specific advantages in its API and scripting capabilities around checkout and the shopping cart that appeal to larger merchants, although its shortcomings elsewhere may offset this. Outside of headless development projects, BigCommerce has some advantages in its support for more complex catalogs and for more aggressive API use that Shopify Plus cannot match. We’ve seen a growing number of small-to-large enterprise businesses opting to use BigCommerce for this reason. At this merchant size, TCO isn’t as much a factor as it is in other areas. We have seen many businesses throw budgets to the winds just because they expect that at their size, it is a necessity. Honestly, that’s one of the biggest drawbacks of going with the ‘enterprise’ class partners for most leading eCommerce platforms – many of them charge more just because they’re Enterprise Class. While there are some substantial differences in agency size, capability, processes, and familiarity with the platform; they’re not always reflected in the ‘enterprise’ badges that eCommerce platforms hand out. Often those badges have more to do with sales volume than actual development capabilities or client satisfaction. It’s yet another reason that small enterprise eCommerce businesses should talk to Coalition before signing up with an agency that has less experience but wields an enterprise badge. Our costs usually reflect the fact that we didn’t have to pay for our relationship with the platform – we earned it through work and client outcomes. That all being said, the total cost of ownership here falls along the same lines it did elsewhere. 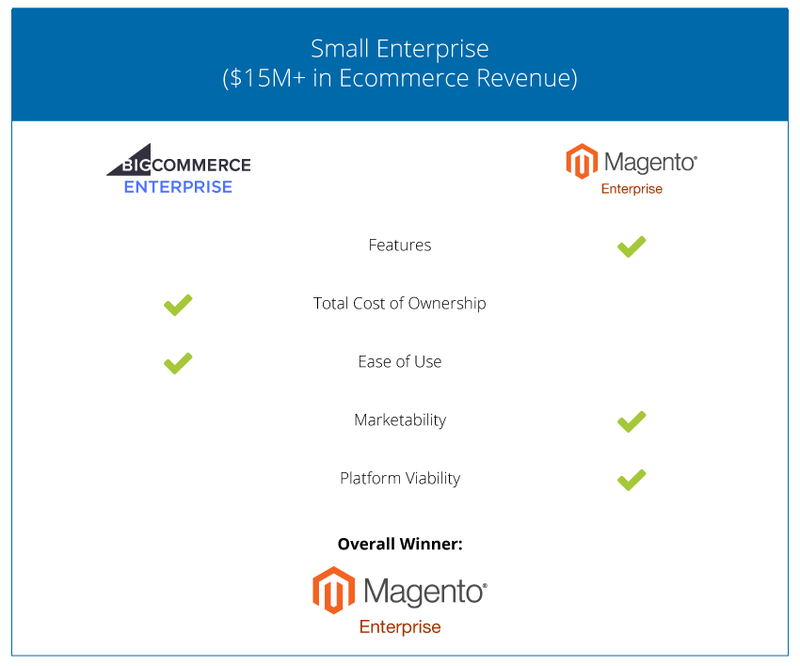 Magento Enterprise, while winning in the feature battle, will tend to cost the most. Shopify Plus and BigCommerce Enterprise tend to have greater parity in ongoing costs, although Shopify’s dependency on custom API development tends to drive up the cost of initial builds and migrations, which gives a slight edge to BigCommerce Enterprise. This is another area where our previous ratings and evaluations provided for the small and mid-sized business categories holds true. Enterprise software users may be caught off guard by the appearance and intuitive interfaces that eCommerce software offer. It has been our experience that most enterprise-grade software solutions are unnecessarily clunky, require specialized language and training to understand, and tend to be modified to support one business unit without regards to others. eCommerce solutions, especially those that were built for a smaller customer who has worked their way up, tend to be much easier to jump into. What can frustrate enterprise users is the lack of certain features or back-end labeling that may seem normal on a larger scale. Most of the eCommerce platforms we are discussing lack functionality that an enterprise tool might have for fulfillment, finance, and manufacturing that would seem obvious to the enterprise user. That being said, the stacked ranking of BigCommerce Enterprise, Shopify Plus, followed by Magento Enterprise remains. BigCommerce Enterprise holds its own, largely because of more built-in functionality and less dependency on custom development or apps. Shopify Plus comes in a close second and beats out Magento Enterprise because of a more robust and intuitive admin feature set and an easier-to-digest language for site administration. Like our previous ranking for mid-market merchants, we can largely repeat the ratings given to each platform here. The overall winner tends to be Magento Enterprise when all the necessary adaptations and extensions are properly aligned. There is a lot more flexibility with Magento Enterprise than what can be found with BigCommerce Enterprise or Shopify. At the small enterprise scale, there are usually more contractors, teams, and business units involved in executing marketing initiatives at scale. Many will have their own software solutions, tracking and reporting requirements, and will need to have proper access and approvals managed efficiently outside of the eCommerce software. Magento Enterprise offers enough flexibility to deliver on those requirements. BigCommerce Enterprise supports a more robust integration offering than Shopify Plus, although Shopify Plus’ recent Launch rollout gives marketing teams much-needed scheduling capabilities that many eCommerce platforms have ignored. We’ve discussed some of the business characteristics of Shopify, BigCommerce, and Magento in previous sections so we won’t rehash the same. However, its good to note that whereas Shopify and BigCommerce are attempting to grow into this space, Magento Enterprise has largely lived here for its entire existence. Shopify and BigCommerce have core audiences and services they need to maintain, so advancing into the small enterprise and large enterprise eCommerce space has to be balanced against other needs. Magento doesn’t have that same consideration since this is its foundational space. If Magento and its Enterprise team can stabilize the industry perception of the platform, clarify their vision for it under the new ownership, and rake back some of the key partners it lost to Shopify and BigCommerce in the past several years, we’d predict that it would set a rather hard-to-break ceiling on the other platforms. However, those are no small tasks for Magento. Time will tell if they have started to right the ship quickly enough to avoid being forced to make room for two new seats at the proverbial table. Our Shopify vs. BigCommerce vs. Magento review ranks BigCommerce – a leading eCommerce platform that launched in 2006 and hosts over 40,000 stores – at #1. The platform gets rave reviews for the ease of its design process. You can drag and drop most of the design elements for your store, which defies the difficulty of a traditional web development approach. Inventory management is another strong usability feature, especially when inventories are large. BigCommerce has three plans: Standard, Plus, and Pro, which offer unlimited storage capacities. Unlike with Shopify, you get unlimited product listings, but you’ll never pay double transaction fees. Each plan comes with unlimited bandwidth, and the latter two come with an abandoned cart saver. BigCommerce’s plans are affordably priced by any standard. Standard costs $29.95/month, Plus runs $79.95/month, Pro is $249.95/month. Because BigCommerce is more feature-rich than Shopify, add-on applications are typically less necessary. BigCommerce also has plenty of free design themes to choose from; however, the consensus is that Shopify’s pay themes are the best. Like Shopify, BigCommerce makes it relatively easy to handle your SEO needs. The process for creating page titles, URLs, meta descriptions, alt tags, and robot.txt is as intuitive as one could hope. However, working with a BigCommerce SEO partner such as Coalition Technologies is still how you get the best SEO results from the platform. Unfortunately, BigCommerce doesn’t offer a blog, so you would need to shoehorn a site into using Blogger or another blogging platform. Shopify hit the eCommerce scene in 2004 and now hosts over 70,000 retailers. With an excellent reputation for usability, the platform is often considered one of the best for small businesses. From setting up an account to getting the store up and running, to performing inventory management, this platform frequently receives rave reviews from business owners who know a lot more about business than computer programming and web development. Shopify has three plans: Basic Shopify, Shopify, and Advanced Shopify. Each plan comes with unlimited bandwidth and file storage, limitless product listings, abandoned cart recovery, and a discount code generator that simplifies offering discounts. Both the Shopify plan and Advanced Shopify offer a professional reporting capability, while the latter has a real-time carrier shipping application for order tracking. Shopify’s plans are nicely priced for what you get. Basic Shopify is $13/month, Shopify costs $54/month, and Advanced Shopify is $107/month. However, because Shopify isn’t especially feature-rich, you may need to purchase Shopify applications to operate your store efficiently, and the design theme you use could run between $80 and $180. Unless you use Shopify’s payment gateway, you’ll also pay double transaction fees: one fee to Shopify and another to a merchant service. Like its competitors, Shopify lets you create your page titles, URLs, meta descriptions and other SEO elements with relative ease. However, it has a decisive advantage over BigCommerce and Magento concerning SEO: it offers a built-in blog, which is great for boosting traffic to your website via inbound marketing. If you need assistance creating content for your store’s blog, Coalition Technologies will provide you with high-quality web content services. The final installment of our Shopify vs. BigCommerce vs. Magento review focuses on Magento, which started in 2009 and hosts the stores of over 200,000 businesses. Magento’s ease of use depends entirely on which plan you choose. The platform’s plan for small businesses, Go, has a highly intuitive user interface, as expected. The ultra feature-rich Enterprise Edition plan and open-source Community Edition plan, however, are for skilled users of eCommerce platforms. Go has four sub-plans whose features are comparable to plans from Shopify and BigCommerce: Get Going, Going Places, Go Beyond, and Go Anywhere. Notable differences are that each plan has limited bandwidth and 5 GB is the top storage tier. Enterprise has two sub-plans that offer enterprise-class web business features: Enterprise and Enterprise Premium. Community Edition’s open-source platform can be configured to offer any features of Enterprise Edition. Go has the most affordable entry point of the plans reviewed here, but with its limited bandwidth and storage capacity, this isn’t surprising. Licensing fees for Enterprise Edition start at $15,550 and top off at around $50,000, which isn’t bad considering that some Enterprise-level shopping cart software has a six-figure fee. The open-source Community Edition, of course, is free; its true cost depends on the cost of the programming and web development you use to develop it. Magento’s plans come with built-in SEO capabilities as a part of their “extensibility” options. The Go plans and Enterprise plans have a highly developed knowledge base that explains optimization strategies—information that’s most useful for Go plan users who are newcomers to SEO. Like BigCommerce, Magento also keeps its users out of the opportunity to post entries in a built-in blog. Creating an off-site blog or inserting blogging platform is the only alternative. While BigCommerce is our go-to platform, there are definite advantages to Shopify and Magento. We recommend all three platforms to our clients, depending on their specific needs. The Shopify vs. BigCommerce vs. Magento review above offers a basic overview of how the eCommerce platforms stack up regarding five areas that impact all users: ease-of-use, plan features, cost, SEO capabilities and each platform’s business viability. Depending on your specific preferences in these areas, you may now know which platform you wish to use, or at least know which one you would rather avoid. If you need help making a final decision, contact Coalition Technologies. We have helped hundreds of businesses choose the right eCommerce platform. As a core BigCommerce partner, Shopify partner, and top Magento partner, we have helped numerous companies get the most out of these platforms with web design, content creation, marketing, and SEO. To learn how we can help you maximize the productivity of your business’ shopping cart software, call us today at (310) 905-8646, or click here to use our contact form.